The manner in which Pep Guardiola’s Manchester City have swept aside all before them this season has been mightily impressive. 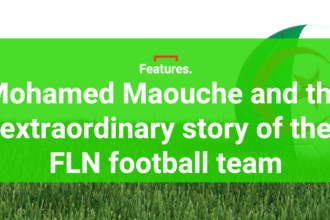 Some observers have even gone so far as to say they are the best Premier League team ever. Whether you subscribe to that opinion or not, it is surely now only a matter of time before Vincent Kompany lifts the Premier League trophy aloft for a third time. With a record-breaking 15 wins in a row, including that derby triumph over fierce rivals Manchester United, it seems there’s no stopping City. The 4-3-3 Guardiola deployed at Old Trafford was slightly different to his usual tactical system, but the fluidity and constant movement of the front six really caught the eye. United simply couldn’t live with them. Regardless of the formation used or the personnel selected, Guardiola’s key principles remain the same; control the game through possession of the ball, while pressing intently without it. Few opponents go to Old Trafford and enjoy 65% possession but that is precisely what City achieved at the weekend, keeping the ball out of United’s reach and swarming all over them whenever it was lost. In order to get your FM18 team playing in the same manner as Guardiola’s City, sorting out the team instructions and getting the players accustomed to the system are imperative. 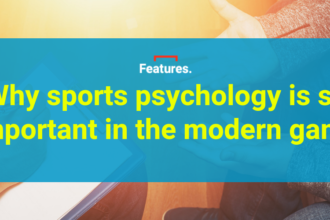 Depending on the strength of your opponents, the overall mentality should shift between control (against equal or higher calibre opponents) and attacking (when you face lesser sides). Playing out from the back is a key part of the system and it all starts with the goalkeeper. Despite his incredible passing range, Ederson usually distributes the ball short to one of his defenders or Fernandinho when he drops in between the two centre-backs. John Stones is the archetypal ball-playing defender while either Nicolas Otamendi or Kompany alongside him are more robust in their approach. It’s also important to get the right tempo and zones of attack. With flying forwards such as Raheem Sterling and Leroy Sane, City can certainly play fast-paced on the counter-attack. But generally speaking, they look to dominate with a slow build-up through the middle before spreading the ball out wide in the final third. Guardiola’s greatest team to date was the Barcelona side he coached between 2009-12 which had Xavi and Andres Iniesta running the midfield. Similarly, at City, Guardiola has centred his side around the exceptional creative qualities of David Silva and Kevin De Bruyne in the centre. 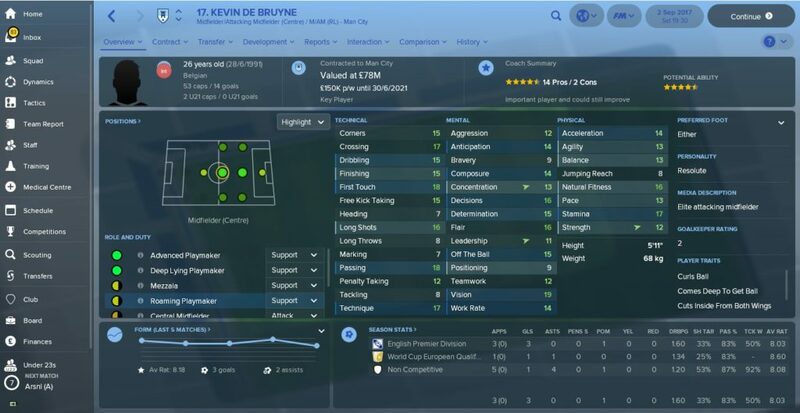 In FM18 terms, De Bruyne has been predominantly used as a ‘deep-lying playmaker’ this season or, as he was against United, a ‘roaming playmaker’, while Silva has played slightly higher up the pitch in an ‘advanced playmaker’ role. De Bruyne’s athleticism and technical qualities make him an outstanding candidate to play as an RPM in the game. De Bruyne’s varied skill-set makes him perfect for FM’s Roaming Playmaker role. With two playmakers flanked by attack-minded full-backs, someone needs to anchor the midfield and offer protection to the centre-backs. In Fernandinho, City have an exceptional regista. The Brazilian has the technical ability to recycle the ball quickly while also offering a combative edge to win it back. Now to the attacking trio at the top end. In many ways Sane is a throwback winger who likes to stay wide, either getting to the byline to cut the ball back or arriving late in the penalty area at the back post to score himself. On the opposite flank is Sterling, who has become a ‘clutch’ player for his team this term. Sterling has shed his tag as a player lacking in end product to come up with some crucial late goals in the Premier League and Europe. 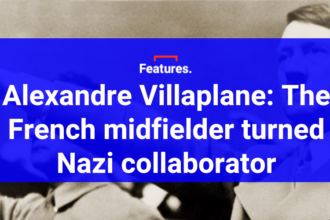 On FM18, Sterling’s role can be neatly described as that of a ‘Raumdeuter’, or wide poacher, whose job is to pull the defence out of position with his unpredictable movement, then exploit the space to score or assist. 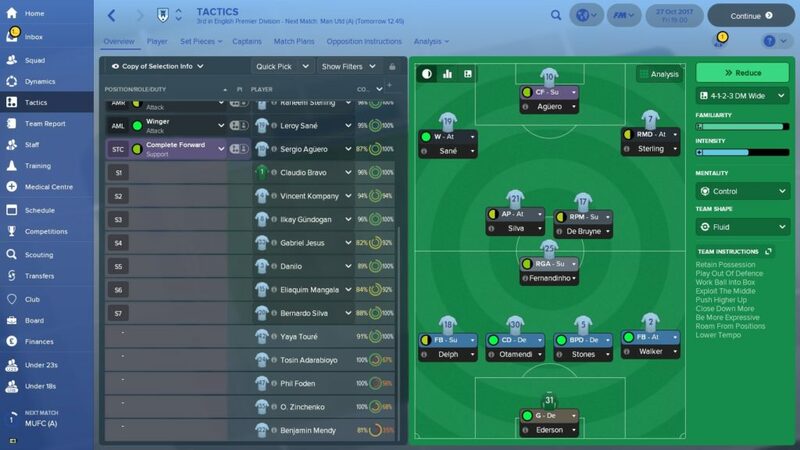 Replicating City’s 4-3-3 on FM18. Then finally there is the central striker. Against United, Guardiola opted for Gabriel Jesus in place of Sergio Aguero with the Brazilian effectively playing as a false 9. Against most other sides, City’s central striker plays more of a complete forward role, finishing chances, linking the play and creating opportunities for others, while also tracking back and helping out defensively. 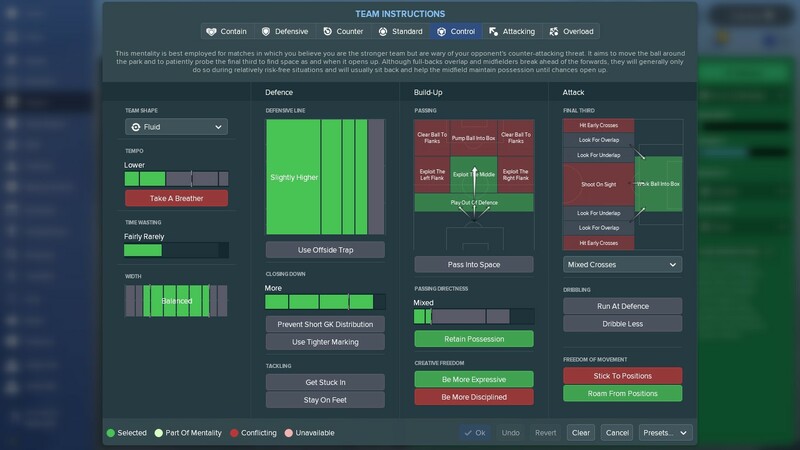 Obviously results will tell you whether or not the tactic is proving successful, but you should also use FM18’s analytical tool to see whether the roles and instructions are working. Ideally, you’ll want to see something like this. As you can see, against high-quality opposition in Real Madrid, City have dominated the game, creating plenty of chances and keeping their visitors quiet in attack. Of course, with such statistics, you’d be hoping for a larger margin of victory, but what this shows is that this tactic can work well against elite opponents. Possession of the ball is largely concentrated in the middle segment of the pitch, where the two playmakers are situated, while the focus of attacks is pretty evenly spread across the front three, meaning there’s an offensive threat provided from all angles. So what are you waiting for? 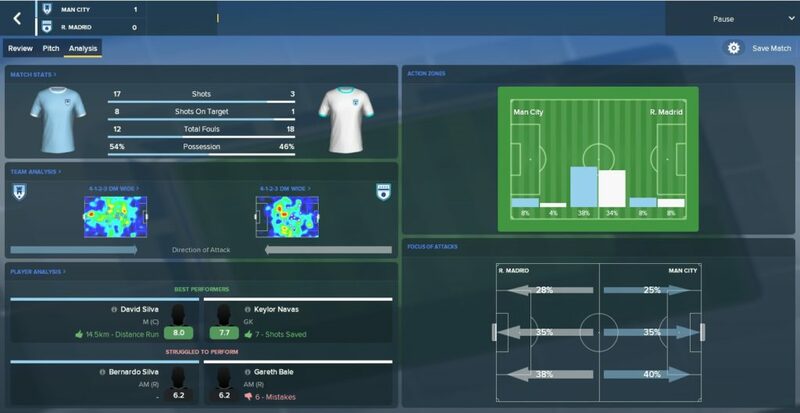 Load up your save and channel your inner Pep by giving this tactic a go.